Our nail care services feature OPI and CND products to ensure the highest quality. Relax in our whirlpool spa pedicure chair, and let the backrest gently massage you while your feet soak in a warm water bath of soothing jets. 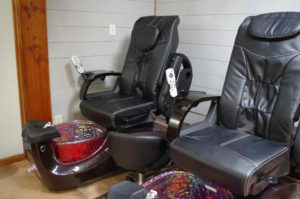 Treatments include massage and moisturinzing of the lower legs and feet, followed by a classic pedicure. Luxury treatments extend the papering with a moisturizing mask on the lower leg.